Even as astronomers await a verdict on construction of a huge telescope on Mauna Kea, they are still trying to figure out how to pay for the next stargazing Goliaths. It is high noon, again, for astronomers who want to erect a gigantic telescope on Mauna Kea, the grand volcano on the Big Island of Hawaii. On June 21, the Supreme Court of Hawaii will hear oral arguments in Honolulu on whether to approve a building permit for the telescope, which would be the biggest and most expensive in the Northern Hemisphere. This same court rescinded the telescope’s permit two-and-a-half years ago on procedural grounds, after protests had prevented construction on the mountaintop. The Thirty Meter Telescope (named for the diameter of its main light-collecting mirror) has been 15 years in the planning. It would be one of three gargantuan telescopes now in the works that could transform astronomy in the 21st century. If they don’t get clearance to start building on Mauna Kea soon, the Thirty Meter astronomers say they will build it on La Palma in the Canary Islands, off Africa, where the Roque de los Muchachos Observatory is home to several telescopes, including the 10-meter Gran Telescopio Canarias. The Thirty Meter Telescope would be completed in 2029, if construction can start — somewhere — next year. But that’s still a big “if,” and would leave the telescope far behind its rivals in the race to enlarge the scrutiny of the heavens. The Mauna Kea drama has overshadowed other issues about the financing and future use of the next generation of extremely large telescopes, as they are generically called. Most of the groups involved, for example, have not yet raised all the money and partners required. That in itself is hardly surprising. “It takes a generation to build a telescope,” said Charles Alcock, director of the Harvard-Smithsonian Center for Astrophysics and a board member of the Giant Magellan Telescope Observatory, which is building a rival giant telescope in Chile. You can’t wait for all the money before you begin, he added; construction should start with whatever money is in hand. Both the Giant Magellan and the Thirty Meter Telescope are hundreds of millions of dollars short of their funding goals, according to unofficial estimates from outside scientists. Some astronomers say the Thirty Meter Telescope, which was originally estimated to cost $1.4 billion, will now take some $2 billion to complete. Project officials themselves have declined to say how much they need. In a statement released by the Thirty Meter Telescope International Observatory, Edward Stone, a Caltech professor and executive director of the observatory, said the exact price of the telescope would depend on when and where it was built. The light-gathering ability of a telescope is determined by the area of its main, or primary, mirror. Which means that the 30-meter-class telescopes under development will be 10 times as powerful as the largest telescopes now on Earth, which have primary mirrors 10 meters across. But all this virtue costs money and groundbreaking technology. Following the model of the Keck Telescopes on Mauna Kea, the main light-gathering mirror of the Thirty Meter Telescope will be a mosaic of hundreds of smaller hexagonal mirrors put together like tiles on a bathroom floor. The Giant Magellan, by contrast, achieves its power by combining seven 8-meter-diameter mirrors. However, the Giant Magellan will start up with only four of the mirrors in place, in 2023, making it temporarily the biggest telescope on Earth. It will be eclipsed a year later by another entry in the giant telescope sweepstakes: the European Extremely Large Telescope, being built by the European Southern Observatory, also in Chile. It was originally going to be a mosaic 100 meters in diameter (formally known as the Overwhelmingly Large Telescope, or OWL); it was reduced to 42 meters in diameter and now 39. When it goes on line in 2024, it will be the largest optical telescope in the world. A sore point of both the Thirty Meter and Giant Magellan telescope projects is that neither has received much support from the National Science Foundation, which traditionally finances ground-based astronomy in the United States. There is now a proposal afoot to fix this: According to the plan, which has many bureaucratic, academic and political hoops to leap through, the National Science Foundation would contribute a quarter of the cost of each of the two telescopes in return for access to observation time for outside astronomers. Otherwise, all the telescope time would be reserved for astronomers from the institutional partners in those collaborations. David Silva, director of the National Optical Astronomy Observatory, said the idea arose last year during discussions of an upcoming survey of astronomical priorities by the National Academies of Science. Once a decade, the academy convenes a blue-ribbon panel to recommend how to spend federal dollars. The 2020 survey starts this fall, when someone is chosen to lead the main committee. Previous panels have given projects like the Hubble Space Telescope important political and financial momentum. An obvious question about the survey, Dr. Silva recalled, was what to do to boost one or both of the Giant Magellan and Thirty Meter telescopes. The two projects started up a few miles apart in Pasadena — at the Carnegie Observatories and at the California Institute of Technology, partners with the University of California — with very different ideas on how to proceed. The efforts have grown into sprawling international consortiums, intense rivals for partners and other resources since birth. The Giant Magellan Telescope, under construction at the Las Campanas Observatory in Chile.CreditMason Media Inc.
“Both projects finally woke up to the fact they are being creamed by the European 39-meter,” said Matt Mountain, the president of the Association of Universities for Research in Astronomy, which manages the national observatory and other astronomical facilities for the government. Dr. Silva and others, most notably Dr. Mountain, concluded that the two projects would have a better chance of success if they joined forces and put forward a unified science case. “A bigger umbrella would work better,” Dr. Silva said in an interview. Without a plan, he pointed out, American astronomers were facing the looming possibility of not having access to the largest telescope on Earth — after a century of dominance with telescopes like the 200-inch on Palomar Mountain in California. The situation is reminiscent of the plight of American particle physicists, who ceded leadership in high energy physics a quarter century ago when the Superconducting Supercollider was canceled, he said. CERN then built the Large Hadron Collider in Switzerland, which has been the center of physics ever since. 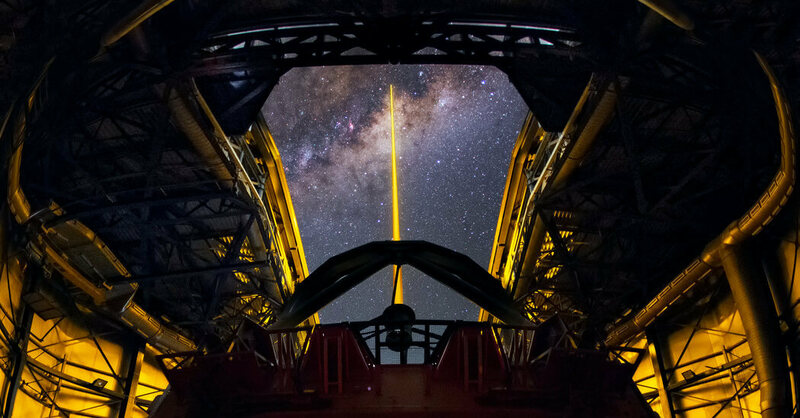 If the Thirty Meter and Giant Magellan telescopes do not reach fruition, Dr. Silva said in an email, American astronomers could still participate in European-led projects in Chile. “But at the very least, that’s a significant psychological line to cross for U.S. astronomy,” he noted. The plan would entail identifying “key science programs,” involving subjects or exoplanets or dark energy that could be pursued with both United States telescopes in a coordinated “big data” kind of way. The national observatory would control the observing time. Dr. Alcock said that as yet there was no firm number on how much the science foundation would contribute, but they were talking about $350 million apiece to the two telescopes. In the end, he said, they would probably get more. Representative John Culberson, Republican of Texas and chairman of a House panel that oversees financing for the National Science Foundation, recently signaled his possible support for the giant telescopes by tripling the proposed budget for the agency’s construction budget for 2019. “There should be enough room in the international community for three E.L.T.s,” Dr. Alcock said. But where they will be is still an issue. Mauna Kea, with its high altitude and calm, dark skies, is considered by some to be the natural place for a telescope like the Thirty Meter. Mauna Kea is part of so-called “ceded lands” that originally belonged to the Hawaiian Kingdom and are now administered by the state for the benefit of Hawaiians. In 1968, the University of Hawaii leased the top 11,000 acres of the mountain for a dollar a year, and began awarding subleases to various observatories for telescopes. But some environmentalists and native Hawaiian groups say the spread of observatories on the summit has polluted the mountain, interfering with traditional cultural and religious practices, or are actually infringing on the sovereignty of the Hawaiian Kingdom. In 2014, protesters broke up a groundbreaking for the Thirty Meter Telescope and then blockaded the mountain, preventing any construction. The same court that revoked the telescope’s building permit is also pondering the sublease for its site. A recent poll shows that a growing majority of Hawaiians favor building the telescope on Mauna Kea, but nobody knows what will happen or who will show up to protest when the court decides on the telescope’s permit and sublease, or when construction trucks can start going back up the mountain. The whole universe will be watching.